transforms the balance of power in the country. A convoy of armoured vehicles from Iraq’s elite US-trained Counter-Terrorism Force seized Kirkuk’s provincial government headquarters less than a day after the operation began, a Reuters reporter in Kirkuk said. Neither side gave a casualty toll for the operation. But an aid organisation working in Kirkuk said several Kurdish Peshmerga fighters and members of the Iraqi forces had been killed in an overnight clash south of Kirkuk – the only serious fighting reported. Fighting between Baghdad and the Kurds could open an entirely new front in Iraq’s 14-year-old civil war and potentially draw in regional powers such as Turkey and Iran. President Donald Trump said the United States would not take sides in the clash but expressed disappointment the two sides were in conflict. The US military said its commanders in Iraq were urging Iraqi and Kurdish forces to avoid escalation and played down reports of fighting. “We support the peaceful exercise of joint administration by the central and regional governments, consistent with the Iraqi constitution, in all disputed areas,” the US State Department said in a statement. “We’ve had for many years a very good relationship with the Kurds as you know and we’ve also been on the side of Iraq, even though we should have never been there in the first place,” he said. Washington arms and trains both Iraqi federal forces and the Peshmerga to fight Islamic State militants. “This day should become a holiday, we’re so happy to have gotten rid of Barzani’s party,” said a man celebrating on a motorbike, waving the blue-and-white flag of Iraq’s Turkmen, referring to the Kurdish leader Masoud Barzani. The Iraqi government considers the Sept. 25 Kurdish independence referendum illegal, especially as it was held not just in the autonomous KRG region but in Kirkuk and other adjacent areas that Kurdish Peshmerga forces occupied after driving out Islamic State militants in 2014. The Peshmerga moved in after Iraqi government forces collapsed in the face of a rapid onslaught by Islamic State, preventing the jihadists from seizing the oilfields. Iraqi Prime Minister Haider al-Abadi ordered the national flag hoisted over Kirkuk and other disputed areas. Baghdad described its army’s advance as largely unopposed, and urged the Peshmerga to cooperate in keeping the peace. The Peshmerga said Baghdad would be made to pay “a heavy price” for triggering “war on the Kurdistan people”. The overnight advance was the most decisive step Baghdad has taken yet to block the independence bid of the Kurds, who have long governed an autonomous tract of northern Iraq and voted three weeks ago to secede. Kirkuk, one of the most ethnically and religiously diverse cities in Iraq, is located just outside the autonomous Kurdish zone. Kurds consider it the heart of their homeland; they say it was cleansed of Kurds and settled with Arabs under former President Saddam Hussein to secure control of the oil. US Defense Department spokesman Colonel Robert Manning declined to speculate on whether Washington might cut off military aid and training to Iraqi forces in the event of a major conflict. The Kurdish secession bid was strongly opposed by neighbours Iran and Turkey. Washington, allied with the Kurds for decades, pleaded in vain for them to halt a vote that could break up Iraq. 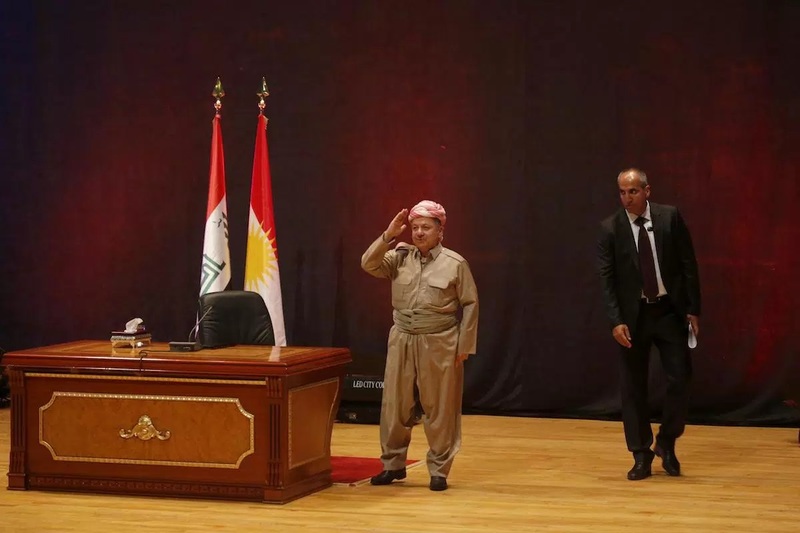 There were signs of internal strife among the Kurds, who have been divided for decades into two main factions, the KDP of regional government leader Barzani and the PUK of his late rival Jalal Talabani. Both parties control their own Peshmerga units. While Barzani’s KDP strongly supported the independence referendum, some PUK figures were more circumspect. Monday’s Peshmerga statement accused a group within the PUK of “treason” for allegedly assisting Baghdad’s advance. “We regret that some PUK officials helped in this plot,” it said. Talabani’s widow, Hero, said the Iraqi operation was carried out with international consent and the PUK was not able to prevent it through talks. “This heroic city was facing an international plan,” she said in a statement. 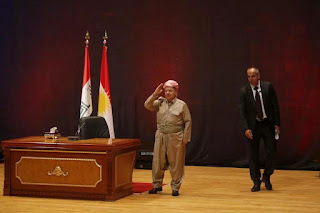 Although Iraqi officials portrayed the Kurds as retreating without a fight, Kurdish officials said Peshmerga had clashed with the “Popular Mobilisation” – Shi’ite Muslim forces trained and armed by Iran that operate alongside regular Iraqi troops. Turkey, which had developed a good working relationship with the Iraqi Kurds and let the landlocked region export oil through its pipes, has swung behind Baghdad, furious at a secession move that might ignite similar demands from its own Kurds. Turkey said it would close its airspace to KRG territory and work to hand control of the main border crossing into the region to the Iraqi central government.